The title of this blog post mentions two terms that have to be explained. 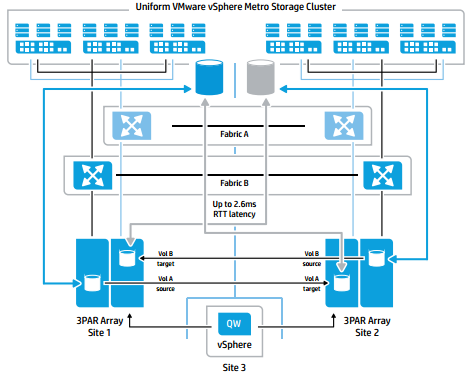 First, a VMware vSphere Metro Storage Cluster (or VMware vMSC) is a configuration of a VMware vSphere cluster, that is based on a a stretched storage cluster. Secondly, HP 3PAR Peer Persistence adds functionalities to HP 3PAR Remote Copy software and HP 3PAR OS, that two 3PAR storage systems form a nearly continuous storage system. HP 3PAR Peer Persistence allows you, to create a VMware vMSC configuration and to achieve a new quality of availability and reliability. In a vMSC, server and storage are geographically distributed over short or medium-long distances. vMSC goes far beyond the well-known synchronous mirror between two storage systems. Virtualization hosts and storage belong to the same cluster, but they are geographically dispersed: They are stretched between two sites. This setup allows you to move virtual machines from one site to another (vMotion and Storage vMotion) without downtime (downtime avoidance). With a stretched cluster, technologies such as VMware HA can help to minimize the time of a service outage in case of a disaster (disaster avoidance). With a uniform host access configuration, the storage on both sides can accessed by all hosts. LUNs from both storage systems are zoned to all hosts and the Fibre-Channel fabric is stretched across the site-links. The following figure was taken from the “Implementing vSphere Metro Storage Cluster using HP 3PAR Peer Persistence” technical whitepaper and shows a typical uniform host access configuration. The second possible configuration is non-uniform host access configuration, in which the hosts only access the site-local storage system. The Fibre Channel fabrics are not stretched across the inter-site links. The following figure was taken from the “Implementing vSphere Metro Storage Cluster using HP 3PAR Peer Persistence” technical whitepaper and shows a typical non-uniform host access configuration. If a storage system fails, the ESXi in a datacenter will lose the connectivity and the virtual machine will fail. VMware HA will take care that the VM is restarted in other datacenter. Another possible non-uniform setup uses stretched Fibre Channel fabrics and some kind of virtual LUN. A LUN is mirrored between two storage systems and can be accessed from both sites. The storage systems take care of the consistency of the data. 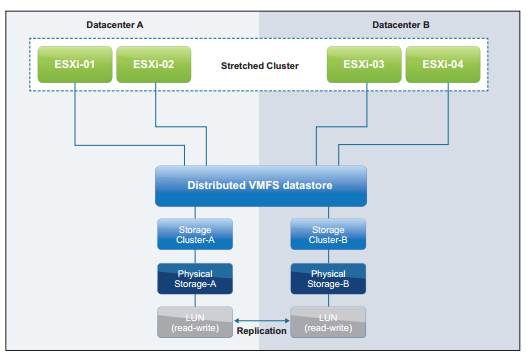 This figure was taken from the “VMware vSphere Metro Storage Cluster Case Study” technical whitepaper. The uniform host access configuration is currently used most frequently. Regardless of the implementation it’s useful to think about the data locality. Let’s assume, that a host in datacenter A is running a VM, that is housed in a datastore on a storage system in datacenter B. As long as you’re using a stretched fabric between the sites, this is a potential scenario. What happens to the storage I/O of this VM? Right, it will travel across the inter-site links from datacenter A to datacenter B. To avoid this, you can use DRS groups and rules. HP 3PAR Peer Persistence uses synchronous Remote Copy and Asymmetric Logical Unit Access (ALUA) to realize a metro cluster configuration that allows host access from both sides. 3PAR Virtual Volumes (VV) are synchronous mirrored between two 3PAR StoreServs in a Remote Copy 1-to-1 relationship. The relationship may be uni- or bidirectional, which allows the StoreServs to act mutually as a failover system. To create a vMX configuration with HP 3PAR StoreServ storage systems, some requirements have to be fulfilled. A VV can be a source or a target volume. Source VV belong to the primary remote copy group, target virtual volumes belong to a secondary remote copy groups. VV are grouped to remote copy groups to ensure I/O consistency. So all VV that require write order consistency should belong to a remote copy group. Even VV that don’t need write order consistency should belong to a remote copy group, just to simplify administration tasks. A typical uniform vMSC configuration with 3PAR StoreServs will have remote copy groups replicating in both directions. So both StoreServs act as source and target in a bi-directional synchronous remote copy relationship. It’s important to understand that the source and target volumes share the same WWN and they are presented using the same LUN ID. The ESXi hosts must use Hostpersona 11. During the process of creating the remote copy groups, the target volumes can be created automatically. This ensures that the source and target volumes use the same WWN. When the volumes from the source and target StoreServ are presented, the paths to the target StoreServ are marked as “Stand by”. In case of a failover the paths will become active and the I/O will continue. The Quorum Witness is a RHEL appliance that communicates with the StoreServs and triggers the failover in some specific scenarios. This table was taken from the “Implementing vSphere Metro Storage Cluster using HP 3PAR Peer Persistence” technical whitepaper. As you can see, the automatic failover is only triggered in one specific scenario. 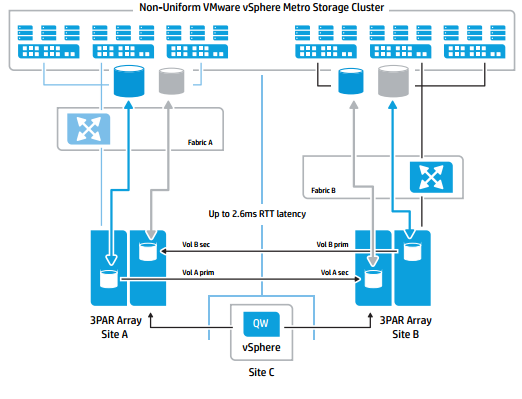 VMware vSphere Metro Storage Cluster (vMSC) is a special configuration of a stretched compute and storage cluster. A vMSC is usually implemented to avoid downtime. A vMSC configuration makes it possible to move virtual machine, and thus workloads, between sites. 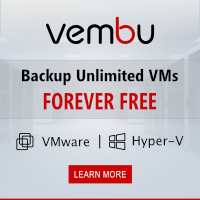 Beyond this, vMSC can avoid downtime caused due to a failed storage system. Using HP 3PAR Remote Copy, 3PAR Peer Persistence and the Quorum Witness, two HP 3PAR StoreServ storage systems can form a uniform vMSC configuration. This allows movement of VMs/ workloads between sites and also a transparent failover between storage systems in case of a failure of one of the StoreServs. Part II of this small series will cover the configuration of Remote Copy and Peer Persistence. 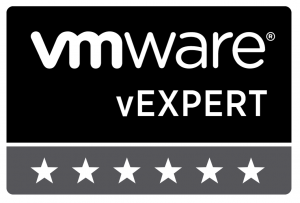 This entry was posted in Storage and tagged 3par, ha, hp, storage, vExpert, vmware on September 8, 2014 by Patrick Terlisten.